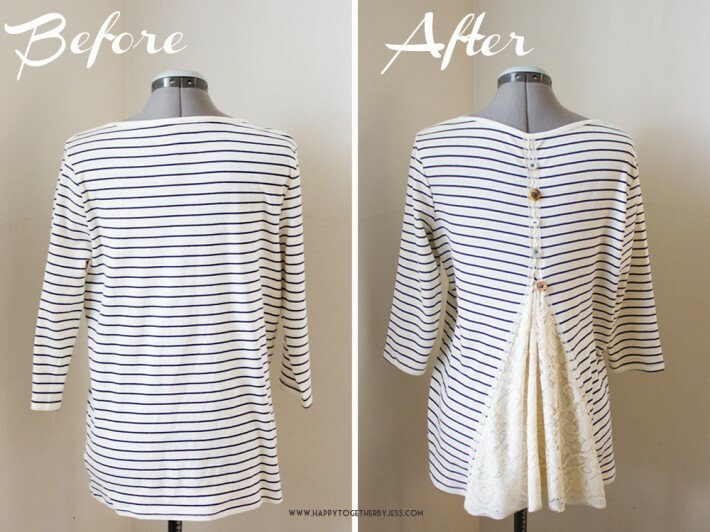 One of my most favorite sewing projects are refashions. It’s fun to just sit down and alter something already made. It doesn’t usually take as long compared to making an item from scratch and it’s satisfying to add a little more “you” to clothing. We all know how much I adore Anthropologie, so I went there for inspiration first. 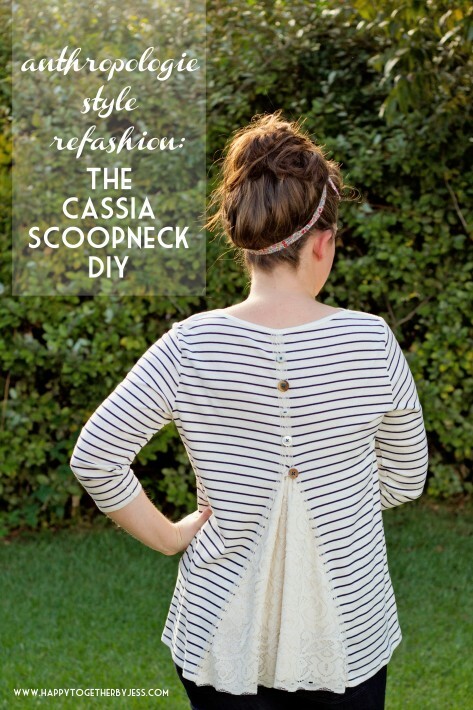 I found the Cassia Scoopneck and decided it would be fun to replicate in my own way. I mainly focused on the back, but there are a few other details you could add to a shirt to look even more like theirs (like the ruched sleeves and the added lace details to the front bottom corner). I originally had a shirt that looked more like the Anthro one. It was dark blue with small white stripes. Unfortunately I went to cut it and accidentally cut the front instead of the back! That made me so sad. That shirt will be made into something else though. I tried to find a shirt thrifting, with no luck, but came across this cute boat neck striped shirt at Walmart. They had it with mustard yellow stripes as well. My friend also gave me a perfect vintage curtain for the back and I used buttons, knit fabric, and lace from my stash. This shirt would have cost me nothing at all if it wasn’t for my accident, but it ended up costing me $7.44 to make versus the $68 the Anthro one costs. Start by folding the shirt in half down the middle. Cut straight up on the middle back until at the height of where the arm holes are. Lay shirt down flat so back is facing you and open the shirt where you just cut. I suggest opening it up to a pretty good size triangle. You can measure the opening to cut out the fabric inserts or you can do what I did below. I placed my knit fabric over the triangle and could see the lines where it was coming through. I then cut the lining triangle piece to be larger than the shirt opening to account for seam allowances. I started with this and then trimmed the bottom a bit. In hind sight, if you wanted it to swoop down more like on the Anthro shirt, you could make the bottom of the triangle more like a half circle instead of straight across. Place your cut out triangle onto your lace and cut out a piece the same size. I placed the bottom onto the bottom edge of the lace so I didn’t need to worry about sewing a bottom seam. If yours is not like this, you can make the lace bottom longer and turn the edge up twice to sew in place and make a seam. Next, place lining piece down right side up. Place lace on top, also right side up. Turn shirt wrong side out. Place Lace/Lining piece in opening. Pin the triangle to the shirt, right sides facing (meaning…. it’s hard to tell in this picture, but the right side of the shirt is turned in to match up with right side of the triangle fabric). The top of the fabric triangle will need to be “bunched up” a bit to fit. Sew one side in place, starting from bottom and going all the way to the top. Make sure to use a large straight stitch. This will allow for some stretch. It might seem a bit tricky as the opening top is at a point, but just sew a little straight past that top part. Then sew the other side together, starting at bottom edge and going up. Make sure to sew a little bit over the opposite side (see picture above). Turn shirt right side out to make sure everything looks okay. Press seams with iron. Turn wrong side out again and trim down the seams. Trim the bottom corners off as well. If using any fabric that would unravel, I suggest either serging them or using a zig zag stitch to prevent them from fraying. Next take a little piece of ribbon (or form a loop here with embroidery thread). Make sure it is big enough to fit the button you want to use for this spot. Pin ribbon on the left side (when looking at it) right at the top of where the fabric insert is. This loop will help bring in the top a bit for a cleaner look. Once sewn in place, trim off the excess trim. Don’t worry about raw edges, as the lace trim will cover it up. Next grab you lace trim and pin on one side. I started at the bottom and pinned in place as I took it to the top. The knit fabric wants to move, so I left some extra trim at the top in case I needed a little bit more once sewing. Sew in place starting at bottom of shirt and ending right below neck line. I ended up sewing close to the right side of the lace trim first and then went back and sewed down the left side. This made the lace stay flat and covered the trim better. Repeat the lace trim process for the other side making sure not to accidentally sew over the ribbon loop. Trim off any excess trim at the neck of the shirt. Use iron to press over where lace trim was sewn to help it look nice and straight. Sometimes using these types of fabrics can cause it to shift some and a good ironing helps. Tip: If your trim is curved like mine, try to line it up so the curves sit into each other. This way there is no gap in between the two sides. Now grab your five buttons. Place them evenly on the top lace part. I taped mine in place so I knew where they would go. Then take your hand sewing needle and embroidery thread and sew on the buttons. I sew mine on this way: Start by sewing down into shirt and come back through. Then sew an X where the button will be. Then sew down button. Go through holes as much as needed for a tight hold. After button feels secure, bring thread up through fabric and underneath button. Knot the two loose ends at least two to three times to prevent untying. Trim off excess thread. Repeat for all buttons. And there you go! The more drape the fabrics have that you use, the prettier the back will turn out. 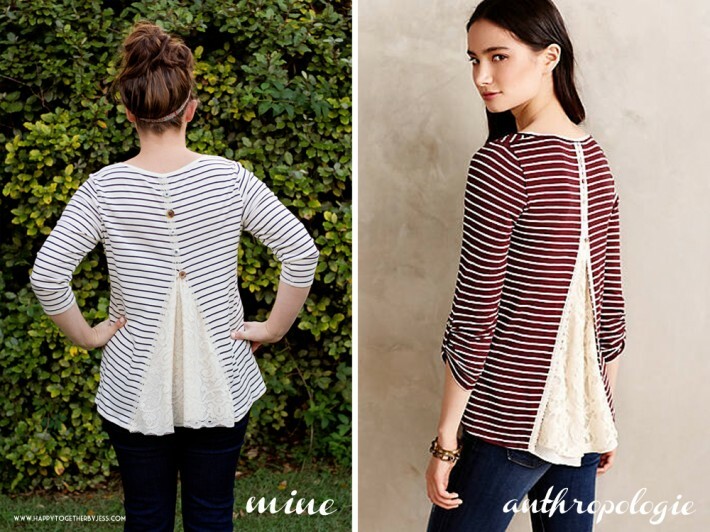 See past Anthropologie Style Refashions and DIY’s here. I adore this! Thank you so much for sharing! I really love it. I just saw such a shirt in a catalogue the other day for 49 Euro. I thought it is a bit much, so I did not buy it. And now after seeing how you made it, I do not understand why I did not get the idea, to make it on my own. The only problem is that we are moving from Austria to Germany in three weeks, and I have already started to get things ready to move. There is no place to sew. So It will have to wait till the end of November! But again, biiiiiiiig thank you!!!! This is one of the best upcyclings I have seen in the last weeks! You are welcome 🙂 We move a lot with my husband being in the military, so I know what it’s like to get that sewing urge when everything is all packed up! lol I hope that your move goes smoothly. Fabulous! This gives me hope that I can still alter a t-shirt into an Anthro top I once had (that fell apart after one washing and was returned). Thank you for the inspiration. What a beautiful! I would like to learn how to enlarge my clothes, do you have more tutorials? this was such a cute idea! Great job! Whoua!….. J’adore l’idée et le style! Je vais me dépêcher de tester ça!… Merci pour le partage et le super sourire!